Three British students have cycled a mind-blowing 17,000 km on a journey from London to Hong Kong over the past 9 months, raising over £13,000 to help fight prostate cancer. After setting off from Buckingham Palace, their journey has taken them all the way across Europe, Central Asia and will finish at Victoria Peak in the former colony this coming Saturday. The students set off in July of last year, entering China in late December. 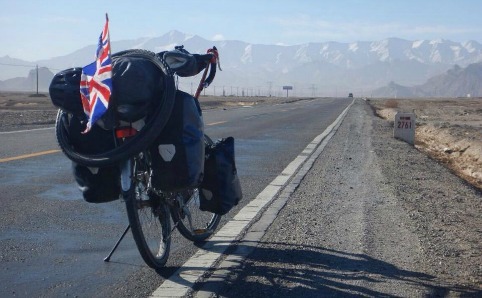 They have since cycled through some of the remotest regions in the west of China, scaled the Tibetan plateau and crossed the plains of Guizhou and Guangdong provinces. Along the way through China they’ve taken some cool photos, grown some outrageous beards and collected a treasure trove of anecdotes. They’ve put up with -30°C temperatures, been attacked by wolves and had plenty of tense encounters with less than cooperative Chinese security forces. For a detailed account of their adventure, you should check out their blog Journey to the East. So far the students have raised over £13,000, but remain just shy of their £15,000 fundraising goal. To support them and donate money to help fight prostate cancer, go to their JustGiving page.